So it’s 2018 and unless you’ve been living under a rock, you’ll be well aware that it’s possible to make a very comfortable living online. Let’s assume that you’ve optimized all of your content to rank well on Google and you’re getting a fair amount of organic traffic. You might be fooled into thinking you’ve made it big time. Unfortunately, unless these visitors are buying your products, subscribing to your courses or completing whatever your call to action may be, then the chances are your pockets might be feeling a little empty. Do you want to know the key to start turning your traffic into dollar signs? Here are three hacks that may seem obvious, but you probably aren’t using them to their full potential. People love convenience. Your visitors don’t want to wait for your site to load, or waste time trying to work out how to use it. They’ve got far more important things to be doing. This is why basic web design is so important. Firstly, find a web hosting service that will ensure that your website loads quickly. This is important for Google too when they rank your website, as they want promote websites with a great user experience. A fast loading website helps you rank higher on Google and keeps your potential customers engaged. Win-win-win for everyone – first hurdle cleared. Now that your visitors on the website, they should be able to quickly clearly identify the purpose of the site. For e-commerce sites, the pages should be displayed using a logical design so that the visitor can find the products they are looking for. Once they move around the site, make it clear what your call to action is! In this case, it is to purchase your goods. This is the deal maker when converting traffic. No matter how much a visitor loves your products, they will very quickly give up and go to a competitor if they can’t quickly find what they are looking for and move through the checkout process. To maximize the convenience, make every step of the process crystal clear for the user. This takes us on to the next tip. If your focus is on sales, then show your customers where to buy the products. That could be as blatant as putting your most recognizable or best-selling products on the front page, or creating a sales page to increase volume on slow moving products. By designing the site around your call to action, you can ensure that customers are only two or three clicks away from buying your products. If they have to spend ages navigating and clicking, the experience becomes inconvenient and they have more time to lose interest. If you’re struggling to convert traffic into sales, then one potential issue is that you haven’t made it clear what you are trying to offer. There’s no excuse for sub-par images in an age where smart phone cameras have razor sharp focus and more megapixels than you can shake a stick at. Go to any successful e-commerce website and you’ll find great photos showcasing the products they offer. You will also notice that there’s a great deal of detail in the way they’re shot. You’ve heard the phrase “a picture speaks a thousand words”, and your images are far more convincing than a whole page of sales copy will ever be. This isn’t to say that copy isn’t important, but it will all be undermined by an awful, pixelated image. The visitors can’t pick up and feel your products, so the images need to offer enough detail to let their imagination fill in the gaps. Essentially, this means high resolution photographs at different angles to pick up every detail of your product. Upload them to your website and have them available to view full screen so that your visitors can inspect them thoroughly. This could prove to be the difference between someone choosing your product or a competitors. 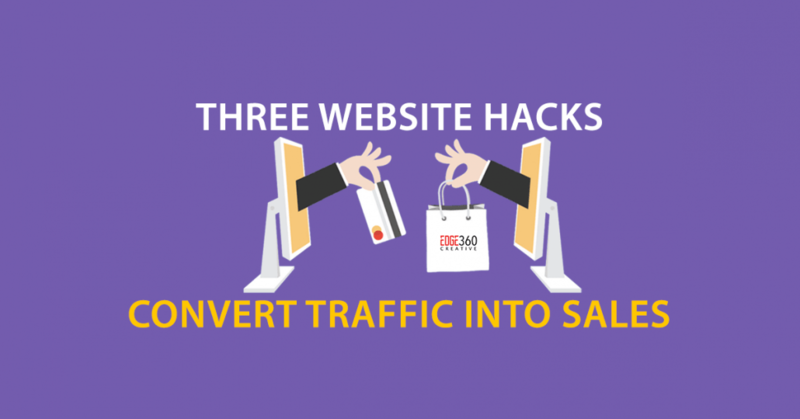 You may have put in a lot of effort to create a professional looking website, but it can still be difficult to convert traffic into sales. By following these tips, you can improve your website’s performance and add revenue to your bottom line. Visitors will find out what your website is about very efficiently and can then either visit another website or conveniently move through the funnel and purchase your products. Convenience is king!